The first 20 to 30 minutes of a thunderstorm are hazardous to asthma patients, according to National Institute of Health Professor, Isabella Annesi-Maesano. Asthma patients should stay indoors during thunderstorms, with the windows shut, to avoid life-threatening attacks. Pollen is drawn up into the sky, during a storm, by dry air. The electricity, that’s generated by the thunderstorm, ruptures the pollen particles. They then sprinkle down to the ground, where they are spread. These allergens could contribute to a rise in asthma attacks, warned Annesi-Maesano. “The effects of climate change and pollution pose an increasing threat to our health – and our lungs are on the front line,” she said. “As an example, increased severe wind storms are carrying pollen in great quantity and over long distances, while at the beginning of thunderstorms the outer membranes of the pollen disrupts, releasing tiny particles into the atmosphere, that contribute to ‘thunderstorm asthma’. “This can be very dangerous for people with pollen nasal allergy that have never experienced asthma attacks and don’t know how to manage them. People affected by pollen allergies, but don’t have asthma, should also be aware to the danger of being outdoors at the beginning of a thunderstorm, warned the scientist. The risks were likely to increase as climate change continued to cause further extreme weather changes, she added. In 1994, a large asthma outbreak was reported in London, and the number of visits to A&E were increased. At the same time, a heavy thunderstorm hit the south of England. Similarly, last year, 8,500 people sought hospital treatment in Australia after a thunderstorm swept over Melbourne. Nine people died over the subsequent week. 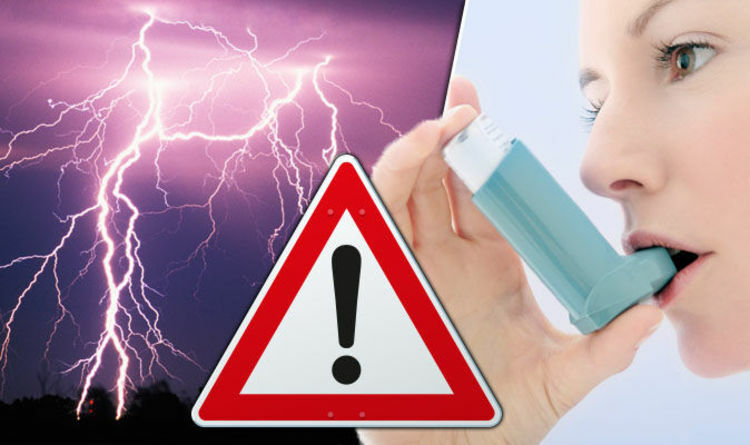 Asthma UK’s Director of Research and Policy, Dr Samantha Walker, said: “We have seen the effect that thunderstorms can have for people with asthma. Just last year several people in Melbourne died as a result of their asthma being aggravated by thunderstorms. “People with asthma who struggle with pollen should try to stay indoors with the windows closed during thunderstorms. Asthma is a long-term condition that affects the airways. Patients have sensitive, inflamed airways, that react badly when they come into contact with allergens. There’s currently no cure for the condition, but medication and treatments could ease symptoms. About 5.4 million people in the UK are currently receiving asthma treatment, according to charity Asthma UK.